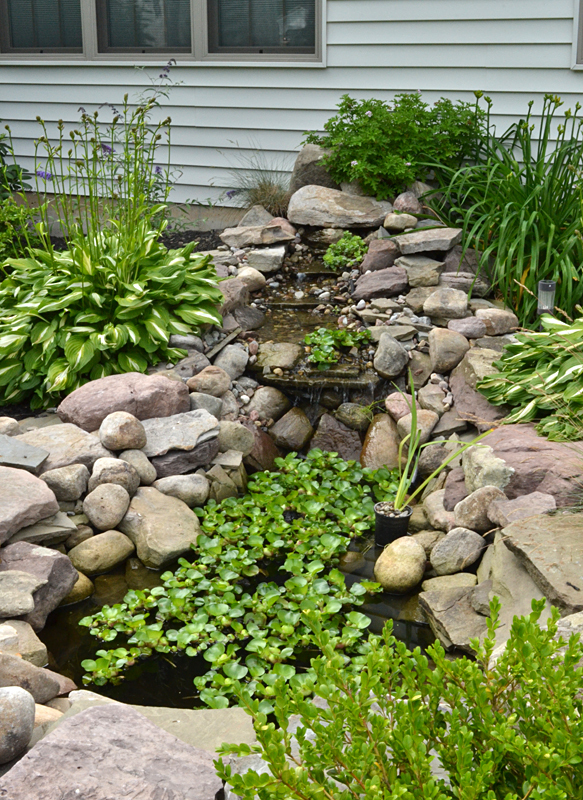 After having their house built five years ago, Paul and Debbie Acquisto of 270 South Lane, Grand Island, enlisted the help of landscapers to get them started with their garden design. They shared their gardens during the Grand Island Garden Tour, a new garden walk that was part of the National Garden Festival this year. It was held July 6 and 7. Even though they worked with landscapers, the couple didn’t attempt to do everything at once. Every year they have added something. 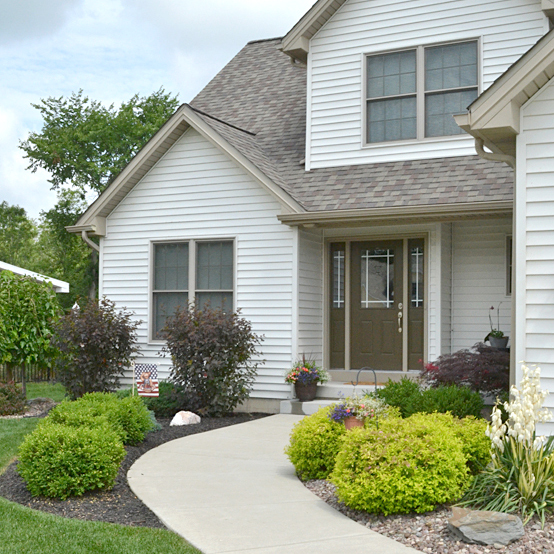 Instead of gardens dominated by flowers, Debbie prefers a more natural look. Shrubbery is used extensively. 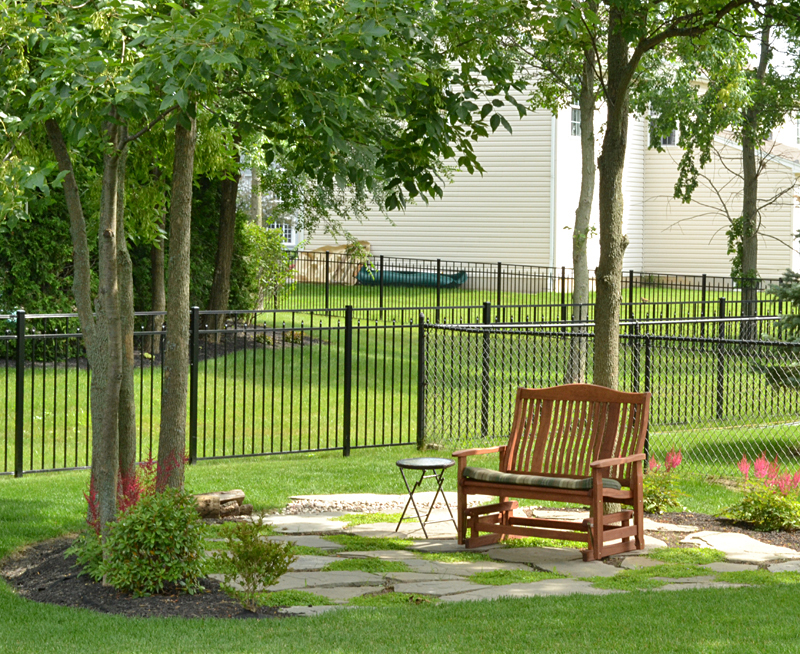 A restful seating area is situated beneath the trees in the backyard. Sedum grows between the flagstones and small beds were developed around the trees. Not only does that add to ambiance of the area, it makes it easier to mow, Paul pointed out. Herbs are grown in the flower boxes that decorate the shed. 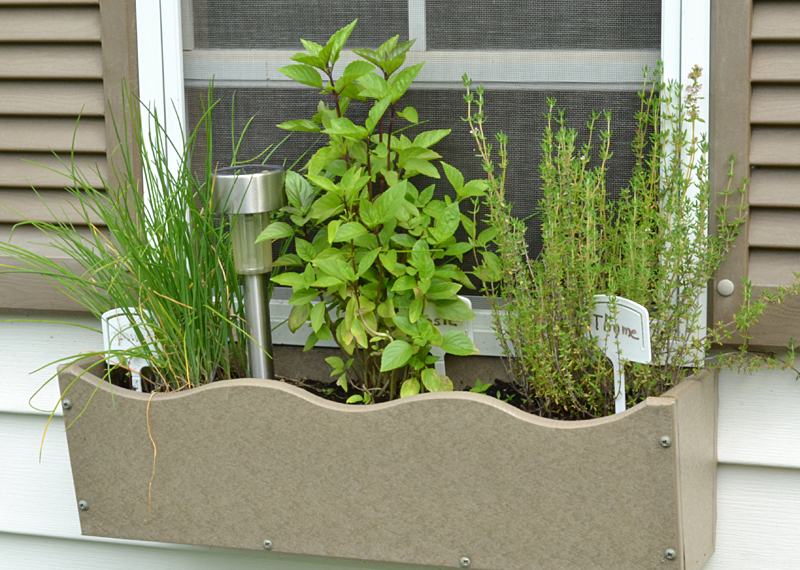 Herbs can really spread, and the small planters keep them contained. 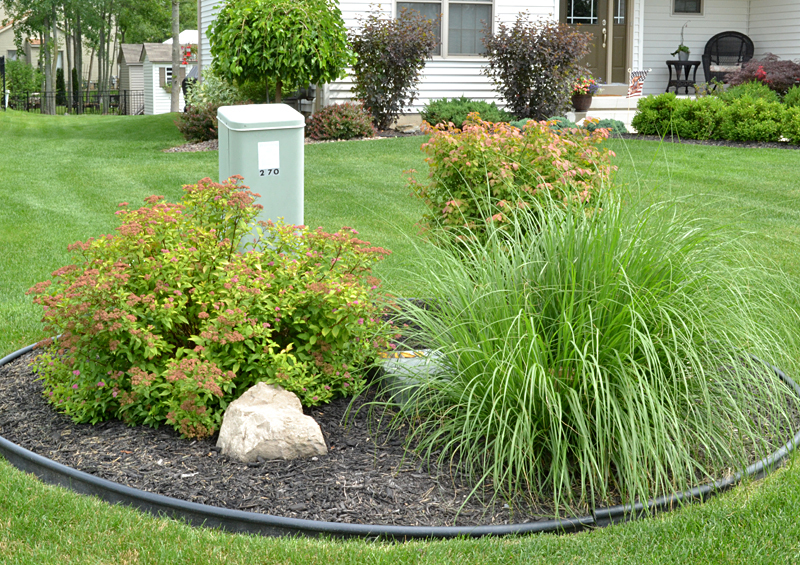 In the front yard, plantings help disguise the electrical boxes. The Acquistos enjoy hearing the waterfall through the windows at night. The red double impatiens looks beautiful, but it is a variety of Impatiens walleriana, which is susceptible to downy mildew. We’ll hope that Grand Island remains safe from this blight. The spikey plant is Cordyline australis, the white flower is euphorbia and the blue flower is lobelia. Read more about how downy mildew is killing impatiens and what you can plant instead. The Buzz Around Hamburg Garden Walk will be held rain or shine. Maps for the free self-guided tour will be available at the Memorial Park bandstand, corner of Lake St. and Union St., Hamburg. Coupons for village restaurants and businesses will be included in the brochure. A vendor fair will be held at the Memorial Park. All participating gardens will be clearly marked with “garden participant” signs. The Historic Niagara Falls Garden Walk covers the Main Street core and neighborhoods from Fourth Street and Park Place to Orchard Parkway and Pierce Avenue. 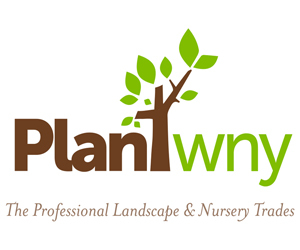 A special feature is florists, nurseries, artists and other vendors offering plants, garden art and more. Be sure to bring questions for Master Gardeners, who will be on hand with expertise to help solve garden woes, and there are plenty of businesses and restaurants along Main Street to explore and enjoy. The tour is free and self-guided. 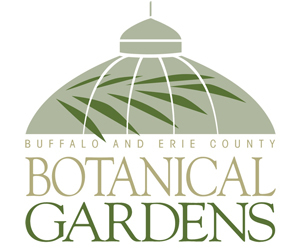 The 2013 Samuel P. Capen Garden Walk is a a free self-guided tour of more than 60 private gardens and carefully nurtured public spaces around the University at Buffalo South Campus. (Samuel P. Capen was the first full-time, salaried chancellor at UB.) Maps will be available at the University Community Farmer’s Market, UB South Campus at Main Street and Kenmore Ave.; University Heights Tool Library, 5 W. Northrup Place, next to Just Pizza, and UB Anderson Gallery, 1 Martha Jackson Place, off Englewood south of Kenmore Ave., all in Buffalo. A Nickel City Indie Market will be held in conjunction with the walk at the University Community Garden, 73 Tyler St., Buffalo. For more information, email extravateam@gmail.com.Visit the Samuel P. Capen Garden Walk on Facebook or email them at capengardenwalk@ourheights.org. 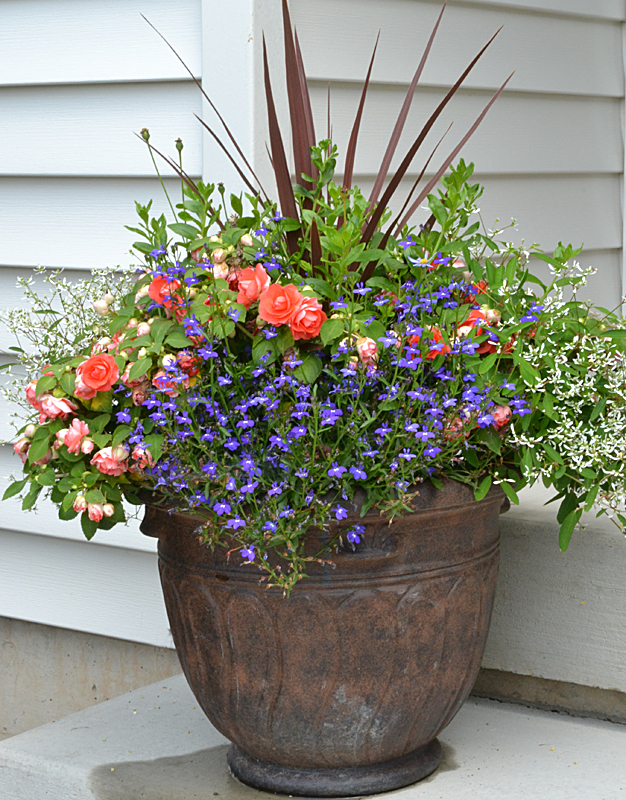 The 9th Annual Lockport in Bloom is a citywide garden tour that takes place in Lockport (just 18 miles east of Niagara Falls and 29 miles north of the City of Buffalo). Maps will be available the day of the event at the Kenan Center, 433 Locust Street, Lockport. (The Kenan Center was built in the 1850s as a residential estate and now offers a beautiful public garden and an admission-free art gallery.) Maps will be available after June 30 at various local businesses. This garden tour features more than 40 historic homes and gardens throughout the City of Lockport. This is a free, self-guided, walking/driving tour. It will be held rain or shine. For more information, visit their website or follow them on Facebook. A new evening tour, Twilight in the Garden, will be held from 6:30 to 9 p.m. Satuday only. Locations will be specially noted on the Lockport In Bloom map/brochure. Also new this year is a vendor fair to be held 10 a.m. to 5 p.m. Saturday and Sunday on the Kenan Center grounds (near Taylor Theater and information table). Vendors will have many items of interest and for sale to gardeners.